If you haven’t watched our video on this topic, please do so. You can find all the references and sources for that video in the article below! Marduk are currently touring North America. This really bothered some Black Lives Matter and ANTIFA organizations, who are calling for a boycott of their tour, labeling them a Nazi band. While some of the calls for the boycott are endearing, with people asking others to give bad Yelp reviews for the venue, others are calling for all-out violence. Although the groups involved change all the time (BLM Austin was first promoting this boycott, only to then cowardly remove it once we started asking questions), the reasons that they use are always the same. The apparent author of the stories (which are copy/pasted in every call for a boycott) at least according to BLM Austin, is a Facebook user going by the pseudonym“PuppyMayhem.” We reached out to him, but he refused to answer any questions, opting instead to just block us. “Frontschwein” was simply a word used to refer to soldiers serving in the frontlines, similar to how English-speaking nations use “grunts” to refer to those serving in combat. The use of this word predates World War II, the Nazis and, of course, Walther Model’s behavior in the War. Since Marduk often reference WWII in their music, this is seen by some as a clear sign of their Nazism. It’s a non-sequitur, since referencing parts of history does not mean that you approve of any of them, but the regressives pushing for the boycott are not going to let that get in the way. They even demonstrate their absolute ignorance of history, geography, and the band they’re boycotting, by claiming that Marduk’s live album “Warschau,” is named after “the site of a Nazi concentration camp during the Holocaust.” At no point did it occur to them that the album is named after the German-name for Warsaw, the city where that album was recorded. This comment, which basically anyone would see as unremarkable, has been construed as some sort of clear sign of Morgan‘s wicked ways. What they also got from my article, even though it’s never mentioned, was that Morgan was Varg’s housemate, and used that (false) claim as a way to further their point regarding Marduk‘s Nazism. I’m not really sure I follow what they’re trying to say, although I guess they mean that if you have a roommate you immediately share everything they believe in, and are an accomplice to whatever it is they end up doing 30 years after you last shared a roof. They also go out of their way to point at Varg and repeat some of the propaganda that the French government used against him. It’s atrocious, since it seems to further the points made by a government that used (and continues to use) anti-terrorism legislation and methods to stomp on dissent. Basically the same kind of things ANTIFA and BLM people would criticize if it happened to someone on their side of the political spectrum. Once again, it’s not about principles, it’s about supporters. Not wanting to limit their attacks to Marduk alone, they have also extended their hatred to Incantation, one of the opening bands in this tour. 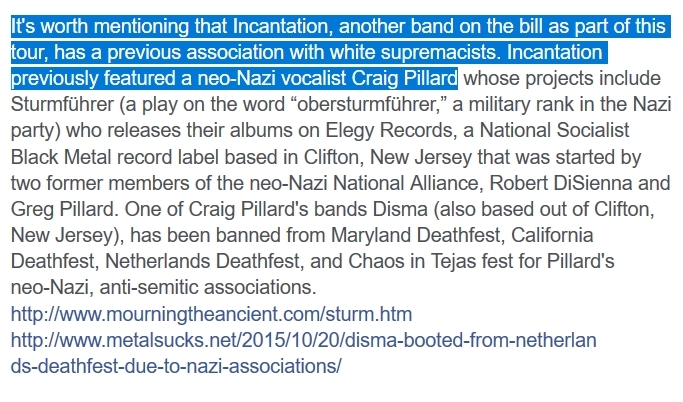 Here they point out that Craig Pillard, the singer of Disma, and alleged white supremacist, used to be in the band. They conveniently omit that Pillar was last involved in Incantation‘s music back in 1994, and that Pillard‘s alleged views are not present in Incantation’s music. Clearly, they’re not about to let facts get in the way of the narrative. Entering squarely into the world of conspiracies, some have argued that Marduk’s overt anti-Christianity is just a cover-up for their anti-semitism. I’m guessing that antisemitism is what took them on tour to Israel. Without putting forward any evidence, they say that the main theme of the album Panzer-Division Marduk is anti-semitism, and then add some quotes (which they conveniently forget to cite) taken verbatim from the book “Subgenres of the Beast” by Yrgana Kegan, in particular the section where she talks about National Socialist Black Metal. The funny thing is that they somehow missed the fact that only a couple of pages later the author includes Marduk among the bands that have been the victims of false accusations of Nazism and fascism. As the list above shows, this boycott is completely nonsensical. It’s the result of ignorance about not just the band, but also the world itself. Its idiocy, however, should not merely be a source of amusement for us, but also serve as a clarion call to stand up against the self-appointed regressives who want to be the sole arbiters of the information we receive. Let’s not give them the chance. We reached out several times to BLM Austin (via e-mail after they blocked us on Facebook), Come And Take It Productions, Grizzly Hall, and the ANTIFA person singled out by BLM-Austin, but received no responses. As an ads-free publication, Metal Blast relies exclusively on the support of our readers. If you enjoyed this article, please consider supporting us via Patreon, or make your shopping via one of our Amazon affiliate links.